bGE Healthcare (D.G., A.G.), Milwaukee, Wisconsin. BACKGROUND AND PURPOSE: Switching of magnetic field gradients is the primary source of acoustic noise in MR imaging. Sound pressure levels can run as high as 120 dB, capable of producing physical discomfort and at least temporary hearing loss, mandating hearing protection. New technology has made quieter techniques feasible, which range from as low as 80 dB to nearly silent. The purpose of this study was to evaluate the image quality of new commercially available quiet T2 and quiet FLAIR fast spin-echo PROPELLER acquisitions in comparison with equivalent conventional PROPELLER techniques in current day-to-day practice in imaging of the brain. MATERIALS AND METHODS: Thirty-four consecutive patients were prospectively scanned with quiet T2 and quiet T2 FLAIR PROPELLER, in addition to spatial resolution–matched conventional T2 and T2 FLAIR PROPELLER imaging sequences on a clinical 1.5T MR imaging scanner. Measurement of sound pressure levels and qualitative evaluation of relative image quality was performed. RESULTS: Quiet T2 and quiet T2 FLAIR were comparable in image quality with conventional acquisitions, with sound levels of approximately 75 dB, a reduction in average sound pressure levels of up to 28.5 dB, with no significant trade-offs aside from longer scan times. CONCLUSIONS: Quiet FSE provides equivalent image quality at comfortable sound pressure levels at the cost of slightly longer scan times. The significant reduction in potentially injurious noise is particularly important in vulnerable populations such as children, the elderly, and the debilitated. Quiet techniques should be considered in these special situations for routine use in clinical practice. The primary source of acoustic noise in MR imaging procedures is the pulsed currents generated in gradient coils for spatial encoding of the MR signal.7 These currents, in the presence of the strong static magnetic field of the MR imaging system, induce significant (Lorentz) forces that cause vibrations in the gradient coils, which, in turn, generate a compression wave in the air perceived as the scanner noise.8⇓–10 Previous methods used to ameliorate the high acoustic noise levels of clinical MR imaging include acoustic insulation of the scanner bore, resulting in reduced bore diameter and gradient waveform shaping/filtering11,12; bandwidth limiting13; and restricting gradient performance—each trading image quality and acquisition speed for only modest noise reduction. More recent studies have demonstrated that innovative pulse-sequence modifications can be applied to achieve substantial reductions of acoustic noise while maintaining image quality. Novel, almost silent sequences have recently become available.14⇓⇓–17 Before these new techniques can be widely adopted, validation against traditional techniques must be performed. In this study, we evaluated the image quality of new commercially available quiet T2 PROPELLER (Q-T2) and quiet T2 FLAIR PROPELLER (Q-FLAIR) sequences in comparison with our standard of care conventional T2 PROPELLER (C-T2) and T2 FLAIR PROPELLER (C-FLAIR) techniques. To our knowledge, this is the first study to assess the performance of quiet T2 and quiet T2 FLAIR MR imaging applications in day-to-day clinical practice. This prospective single-center study followed the Health Insurance Portability and Accountability Act guidelines, and its protocol was approved by the institutional review board. Written informed consent was obtained from subjects or, in the case of noncompetent patients, their respective parents or next of kin for all procedures, in accordance with the local institutional review board protocol. Thirty-four consecutive inpatients undergoing routine brain MR imaging between February 2013 and March 2014 were included. Eighteen men and 16 women with a mean age of 54 years (range, 21–96 years) were prospectively enrolled in this intraindividual comparative study and evaluated. All patients were given standard clinical ear protective equipment and underwent brain MR imaging examinations for a variety of clinical purposes. The clinical conditions were stroke (n = 6), persistent headache (n = 6), demyelinating disease (n = 5), mental disorder (n = 3), vertigo (n = 2), seizure (n = 2), brain tumor (n = 3), metastatic disease (n = 2), infectious disease (n = 2), recurrent falls (n = 2), and CSF leak (n = 1). MR imaging included all sequences in routine use for each clinical indication, including axial PROPELLER T2 and T2 FLAIR. Added were spatial resolution–matched quiet PROPELLER T2 and quiet T2 FLAIR in the transverse plane. All scans were obtained on a clinical 1.5T MR imaging system (Optima 450W; GE Healthcare, Milwaukee, Wisconsin) by using a 32-channel head coil (24 elements are activated). Section locations were identical across comparison scans. MR imaging data acquisition parameters are summarized in Table 1. Loudness factor: LF = 10ΔL/33.22 = 2ΔL/10. A qualitative comparison of images acquired with quiet and conventional approaches was performed. Matched image sets were gathered from each patient: Q-T2 (n = 34) was compared with C-T2 (n = 34); and Q-FLAIR (n = 31), with C-FLAIR (n = 31). Three patients were not eligible for the T2 FLAIR comparison because both scans were not obtained. A total of 130 image sets presented in the same order were independently assessed by 2 neuroradiologists (with 10 and 25+ years of experience) blinded to the acquisition technique. The images were evaluated qualitatively on an analysis and viewing workstation (Advantage Workstation 4.6; GE Healthcare) for overall quality and gray matter–white matter differentiation, by using a 3-point scale: 3 being better than expected, 2 being as expected, and 1 being worse than expected. Because alterations in multiecho sequence scan acquisition parameters such as echo spacing and echo-train length can manifest as a blur, perceived blurring (yes/no) was evaluated. All scans benefited from inherent PROPELLER motion resistance; thus, this was not measured. Additionally, readers were asked to rank the 2 pair sets for preference and declare images as better, worse, or equivalent (overall preference). Image quality scores were averaged across both readers for analysis and were presented as mean value and SD. Interobserver agreement for assessment of image quality was quantified by weighted κ statistics.18 A nonparametric paired Wilcoxon test was used to compare the qualitative parameters between the quiet and conventional image pairs. Image quality scores for each set of MR images were analyzed. Qualitative results were expressed as mean and SD. Statistical analysis was performed by using commercially available software (SPSS, Version 20; IBM, Armonk, New York). Difference was considered statistically significant at P < .05. The respective average SPL measurements for C-T2, C-FLAIR, and Q-T2 and Q-FLAIR protocols are shown in Table 2. Repeated measurements showed no variation in average and peak SPL; therefore, no SD is reported. The average SPL difference between C-T2 sequences and Q-T2 was found to be 26.4 dB (26% reduction). This represents a sound intensity factor difference of 436.5, a sound pressure factor difference of 21, and a loudness factor difference of 6.2. The SPL difference between C-FLAIR sequences and Q-FLAIR was found to be 28.5 dB (27% reduction), which corresponds to differences in a sound intensity factor of 708, a sound pressure factor of 27, and a loudness factor of 7.2. Interrater reliability was good (Cohen κ weighted = 0.67). No significant difference in image quality was found between conventional and quiet sequences (P > .05). Readers expressed no preference between quiet and conventional T2 sequences, and in all cases, gray matter–white matter differentiation and overall quality were rated “as expected.” Similarly, image quality scores of the Q-FLAIR and C-FLAIR protocols were comparable. In 1 case, Q-FLAIR was preferred over the conventional technique regarding overall quality, while in another case, C-FLAIR protocol was preferred over Q-FLAIR regarding gray matter–white matter differentiation. In all other cases, the quiet and conventional sets were rated “as expected.” When the perceived blurring was assessed, no evidence of blur was noted in any case. Image examples are provided in Figs 1 and 2. A 58-year-old man with post-craniofacial recurrent tumor resection with postsurgical changes. Comparison of C-T2 (A), Q-T2 (B), C-FLAIR (C), and Q-FLAIR (D). 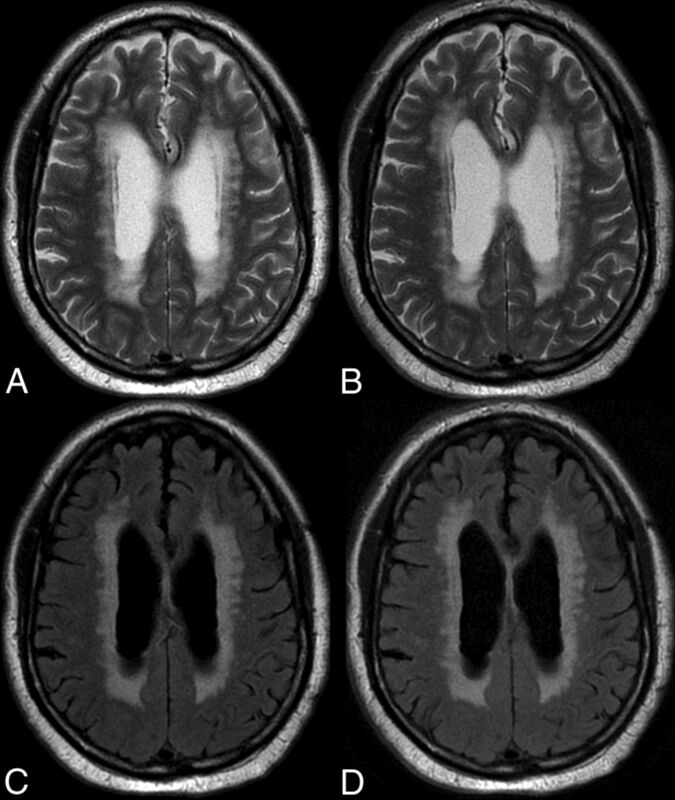 An 82-year-old man with extensive periventricular T2 and T2 FLAIR white matter foci suggesting ischemic small vessel changes. Comparison of C-T2 (A), Q-T2 (B), C-FLAIR (C), and Q-FLAIR (A). Noise levels for clinical MR imaging pulse sequences run as high as 100–120 dB,19⇓⇓–22 levels capable of causing temporary or even permanent hearing loss if hearing protection is not properly applied. The commercially available quiet sequences used in this study drastically reduce noise levels to approximately 75 dB, a reduction in average SPL of up to 28.5 dB. Quiet PROPELLER uses a standard 2D modified radial sampling scheme with an acoustic noise model to optimize gradient waveforms.23 The k-space trajectory and data sampling can be optimized so that gradient steps are smaller than those in conventional PROPELLER, resulting in a scan with noise levels <6 dBA above ambient levels. At a penalty of only slightly longer scan times, Q-T2 and Q-FLAIR provided high-quality images comparable with conventional acquisitions. Spatial-resolution-matched quiet sequences had similar scores for overall quality and gray matter–white matter differentiation without an increase in image blur. We acknowledge several study limitations. Differences in k-space trajectory and overall performance of the quiet techniques required fixed alterations in parameter choices such as TR, echo train, and TE to match spatial resolution and section numbers of the conventional acquisition, potentially contributing to subtle variations in image appearance. While representative of a new class of MR images, these results apply only to the specific approach to noise-reduced imaging and the specific parameter choices made and will not translate exactly to other scanners, techniques, and parameter choices. The small sample size requires a confirmation of our findings in a larger population. As this technology evolves, additional studies will be required in a large population with a variety of disease states. Quiet FSE provides equivalent image quality at comfortable sound pressure levels at the cost of slightly longer scan times. The significant reduction in potentially injurious noise is particularly important in vulnerable populations such as children, the elderly, and the debilitated. Quiet techniques should be used in these special situations and considered for routine use in clinical practice. The authors acknowledge Maggie Fung for her assistance. Disclosures: Idoia Corcuera-Solano—RELATED: Grant: Fundación Alfonso Martín Escudero, Comments: At the time of that research, I was supported by a grant from the Spanish foundation Fundación Alfonso Martín Escudero. Ajeet Gaddipati—UNRELATED: Employment: GE Healthcare, Comments: This work was done as part of my employment at GE Healthcare MR Imaging Department; Patents (planned, pending or issued): pending patent through GE Healthcare, Comments: GE Docket No. 265701 (ZPS 8081.704), Comfortable Acoustic Level Techniques for MRI Pulse Sequences. Dawei Gui—UNRELATED: Employment: GE Healthcare; Patents (planned, pending or issued): GE Healthcare, Comments: GE Doc No. 265701-1. Lawrence Tanenbaum—RELATED: Consulting Fee or Honorarium: GE Healthcare; UNRELATED: Payment for Lectures (including service on Speakers Bureaus): GE Healthcare, Siemens. Dr Idoia Corcuera-Solano was supported by a grant from the Spanish foundation: Fundación Alfonso Martín Escudero. Paper previously presented in part at: Annual Meeting of the American Society of Neuroradiology and the Foundation of the ASNR Symposium, May 18–23, 2013; San Diego, California.